Jason and rick arrived Monday afternoon, new year’s day. So Tuesday early morning Rich and these Utah boys headed for the woods. 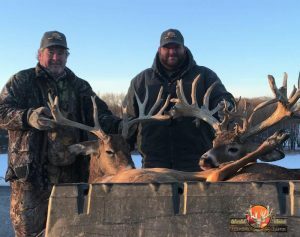 Jason was interested in something fairly big, and rick wanted something more typical, although he really liked the non typical bucks as well. They seen numerous deer in the forenoon, then headed to the local restaurant to grab a bite to eat. However, they didn’t take long with the food, as Jason was chomping at the bit to get back out. He had decided on shooting a big one, possibly our biggest buck left on the ranch. Well, they weren’t in the blind long, and here he comes says Rich, and Jason doesn’t believe it! He says, this one is bigger, are you sure to that’s the right buck? I don’t want you to get in trouble with Owen!? 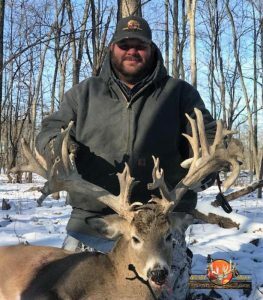 So Rich assured him, yes, that’s the buck, go ahead, so Jason dropped the hammer on him, and Limpy was his! 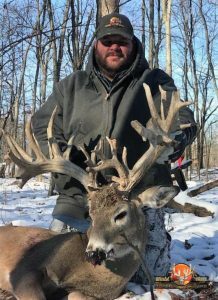 Earlier in the season,this buck had been limping, so he had the nickname Limpy. 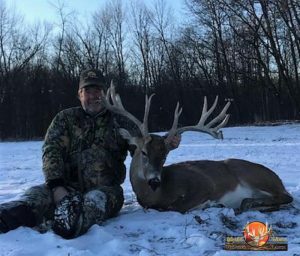 A while later Rick seen the buck he had to have, and he smoked this long brough tine typical buck. Congratulations guys, we may just have to come see about some of your Elk come September!